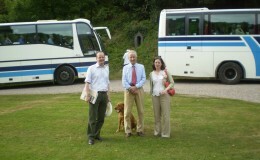 Hartland Abbey extends a warm welcome to coach groups, special interest clubs and societies and offers discounted rates. Guided tours of the house are available by prior request and take approximately 45 minutes- 1hr. Allow extra time for the gardens, woodland walk to beach, lunch and cream tea. (Average visit 2½ – 3 hours inc. gardens, grounds). If you are a special interest group please tell us so that we can arrange a tour with either Sir Hugh or Lady Stucley, or a guide with specific knowledge. For tours with Sir Hugh or Lady Stucley there will be an extra charge; please enquire. Large flat area adjacent to the house; ample parking for coaches. Disabled visitors will be able to view most of the main reception rooms, plus the mediaeval basement, exhibitions, museum and shop, tea room etc. Entry to the house is up some wide steps as it is unsuitable for a ramp. Disabled persons WC. Dogs are welcome in the grounds on leads; Guide Dogs only in the house. Light lunches and cream teas in the Old Kitchen Tea Rooms. We would be very grateful if you could book in advance if possible. Tel. 01237 440044 to book your lunches or teas. Most groups spend from 2 1/2- 3 1/2 hours at Hartland Abbey In order to make a full day out, combine Hartland Abbey and its gardens and grounds with Hartland village with its wonderful pottery, furniture makers, artists and craft shops. The beautiful and historic St. Nectan’s Church (‘the Cathedral of North Devon’) is very close (½ mile). Hartland Quay, renowned for its spectacular cliff scenery and rocky beach, the scene of many past shipwrecks, is 1 mile away. The Shipwreck Museum at Hartland Quay is fascinating and well worth a visit too (Tel:01237441218) or www.hartlandquay.com. There are many other attractions within easy reach; we would be delighted to help with suggestions. World renowned Clovelly is only 5 miles away. 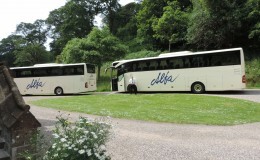 Free entrance, tea or coffee for Coach Drivers and Group Leaders. For larger groups we are able to open at other dates and times; we may also offer a larger discount, please enquire. Delicious light lunches and home made cream teas are provided by our caterers . Please notify in advance. No prepayment necessary but it would be appreciated if the group leader could collect the entry money in advance and present it to the ticket office on arrival. Chip & Pin payment available. House 2 – 5pm. Gardens 11-00am. – 5pm. (Note last entry to House 4-00pm). The Abbey can be opened at other times and dates for groups of over 20 people if required. 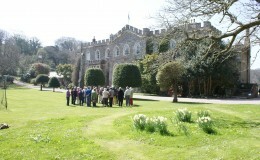 For groups the Gardens, Grounds and Tea Room open at 11am. House opens at 2pm or earlier by prior arrangement (or to suit group schedule). 2019 Exhibitions: ‘William Stukeley – Saviour of Stonehenge’, ‘History of the Hartland Abbey Estate’, ‘Filming on the Hartland Abbey Estate since 1934’. Follow coach parking signs for Hartland Abbey at road junction in the valley. Easy parking/access for discharging disabled visitors.